6 Double Old Fashioned Glasses & Muddler Set. George Thompson & David Hills Designs 1940's. Consider this classic mid century signed new in box Steuben set of Six Double Old Fashioned Glasses with a baseball bat Steuben Muddler, vintage designs new in box, never used with no interior stains or clouding, no chips, no nicks, no cracks, no scratches or bottom display wear, never held ice. These style icons are the perfect foil for your best single malt Scotch, Irish Whisky, whiskey, Bourbon. Each will come wrapped in it's fine flannel Steuben labeled bag (with no tears, stains or mildew/nicotine odors) in original good condition 1940's vintage box (some taping to box). This set with a bottle of his favorite potion would be perfect for his birthday or anniversary gift. Mandatory for your own barware collection and entertaining. Fashioned by George Thompson and David Hills (muddler), designers of many Steuben mid century favorites, these hand made double old fashioned glasses are labor intensive designs that have been retired for many years. 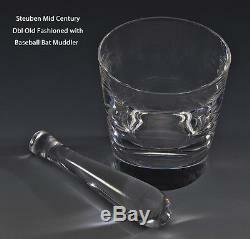 Each glass and the muddler is fully signed with the Steuben name in script. This authentic mid century Steuben set was entirely hand made, mouth blown and hand polished at the glassworks in Corning NY of original 10M formula optically pure Steuben crystal. 4" tall by 3" wide and holds 11 oz. The muddler is about 5 tall. One pound giving good weight and hand like a bespoke suit. Expect minor variations in size as the glasses are mouth blown. Steuben was renown for their rigorous attention to detail and for the high quality of their glass. They stated in their literature that they did not market "seconds". In fact, they noted that such pieces were destroyed in house. Steuben Glass was founded by Frederick Carder in 1903 and was located in the Fingerlakes Region of New York State. By following strict standards for design and manufacture they achieved recognition as the world's premier glassworks. Steuben Glass was frequently the gift of state by US Presidents to foreign dignitaries. Steuben is a luxury brand. Because of these factors, a well maintained handmade Steuben collectible is likely to increase in value over time. My goal is that you are satisfied with these items and the service you receive. I encourage you to ask questions. The art glass that I offer is handmade and as such may vary slightly from item to item. I appreciate your interest in this set and I hope you will take time to look at the other items I have listed on. This week at Legendary Steuben Glass. This Double Old Fashioned design #7889 and muddler #8000 appear in the 1982 and 2003 editions of the MJ Madigan Steuben reference book. This is a labor intensive hand made in mid century USA of original optically pure formula glass set. Would not share the Steuben optically pure formula and techniques with their suppliers in Portugal and Germany. Although the company indicated the outsourcing was to help them expand into the European market, it caused a great deal of friction with the US Steuben highly skilled unionized workforce making labor negotiations more problematic. 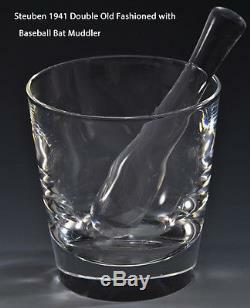 The item "6 NEW in BOX STEUBEN DOUBLE OLD FASHIONED GLASSES & BASEBALL BAT Muddler MCM" is in sale since Wednesday, January 30, 2019. This item is in the category "Pottery & Glass\Glass\Art Glass\North American\Steuben". The seller is "sabinewoman2065" and is located in Ithaca, New York. This item can be shipped to United States.